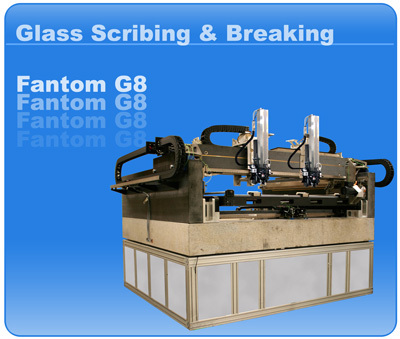 The Fantom G8 Glass Panel Scribing Machine utilizes the latest laser technology for glass scribing and is equipped with two integrated Laser Photonics laser sources specifically geared for processing larger format glass panels for the Flat Panel Display Industry. The Fantom G8 Laser Scribing tool is a part of a new line of industrial laser cutting systems from Fonon DSS. It incorporates a new generation modular design laser and precision direct drive high resolution linear motion system forming a precision, stand-alone, small foot print, automatic tool which can be easily integrated into an inline system. The system is based on Zero Width Laser Cutting Technology® (ZWLCT®). This method splits materials at the molecular level with tremendous speed, no material loss, and no chips or other debris associated with conventional scribe and break techniques.